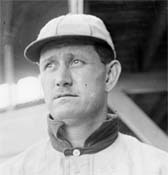 "Big Ed" Delahanty began his career with the Phillies in 1888, briefly flirted wiht the new Player's League in 1890, returned to the Phillies the following year, and finished with the American League Washington Senators beginning in 1902. He narrowly missed the triple crown in1893 with a .368 average, 19 HR, and 146 RBI. His life ended tragically at the age of 35. After being suspended from the Senators, he left his club in Detroit to take a train to New York. Near Niagara Falls, the conductor put him off the train for being drunk and disorderly. Staggering along the tracks in the dark, he fell through a train trestle and was swept over the falls.